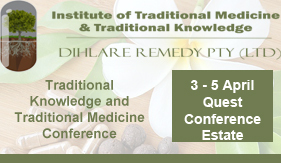 The Vaal University of Technology is to host an international conference on Traditional Knowledge and Traditional Medicine at Quest Conference Estate, Vanderbijlpark, South Africa from 3 – 5 April 2019. The conference will focus on the frontline areas of Traditional Knowledge and Traditional Medicine, including evidence-based practice, scientific cultivation, standard and quality assurance health care and commercialization. The conference will provide a forum for students, researchers, scientists, entrepreneurs and health care professionals to interact on the latest developments and future trends in the multidisciplinary area of Traditional Knowledge and Traditional Medicine. The conference will further bring together leading scientists from all over the world, SADC, South African scientists, THPs and students involved in Traditional Knowledge and Traditional Medicine. The structure of the conference will comprise of keynote lectures, invited speakers, oral and poster presentations. Please Note: Conference Registrations and Abstract Submissions are closed.